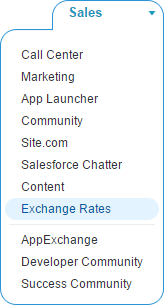 You've got better things to worry about than updating exchange rates in Salesforce. Let us take care of it for you. With just the tiniest bit of setup you can be up and running in a few minutes. Try it out. The first screen during installation is the profile level security. We recommend selecting the option reading Install for Admins Only then clicking the Install button. 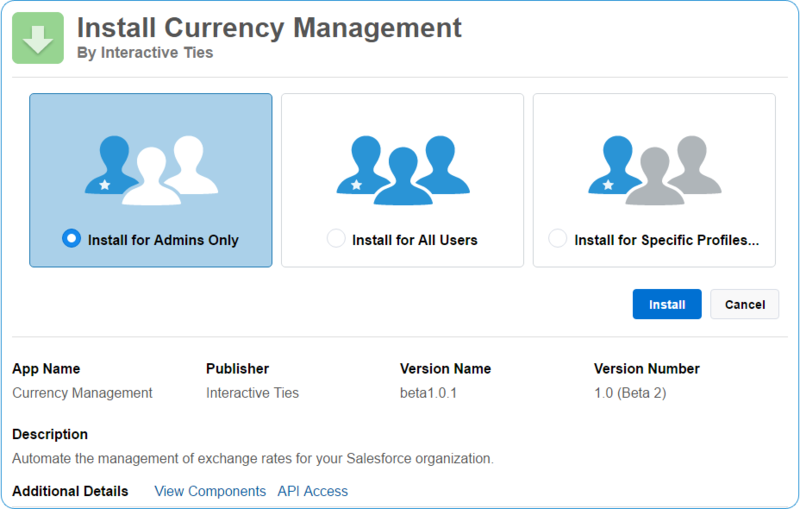 Note: The Currency Management Application is not intended for standard users within your Salesforce organization. Only administrators should configure and use the app. A modal dialog will appear asking you to Approve Third-Party Access. This is an informational screen making you aware of the fact that the application may interact with one or more of the websites listed. Check the box reading Yes, grant access to these third-party web sites and click the Continue button. Note: Depending upon your configuration, this application will send and receive data from only a few third-party websites. However, we have to include all of the potential third party websites to allow for various customer configurations. 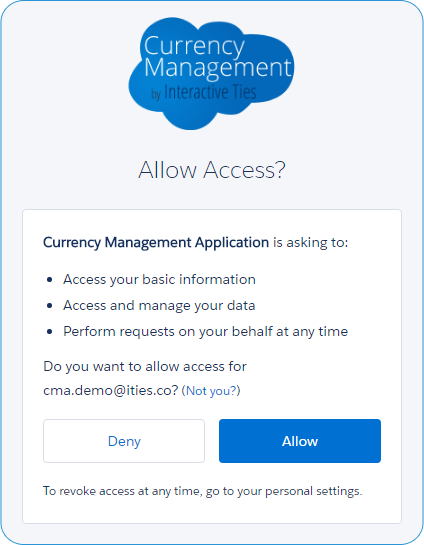 The application may display a screen reading "Installing and granting access to admins Only..."
The application uses OAuth to communicate with your Salesforce org and the exchange rate platform, which you will select later. In order for this communication to happen with regularity we need you to authorize the application. Select the Exchange Rates application from the Force.com App Menu. You should end up on the tab reading "Currency Maintenance" but if you are not then please click the tab. Click the green button reading "Provide Your Authorization". Note: OAuth is an open protocol to allow secure API authorization in a simple and standardized way from desktop and web applications. We implement the OAuth 2.0 Authorization Framework, so users can authorize us to access Force.com resources on their behalf without revealing their passwords or other credentials to us. You will be directed to an authorization screen. Click the "Allow" button. You will be directed to a success or failure page depending on whether or not the authorization worked. 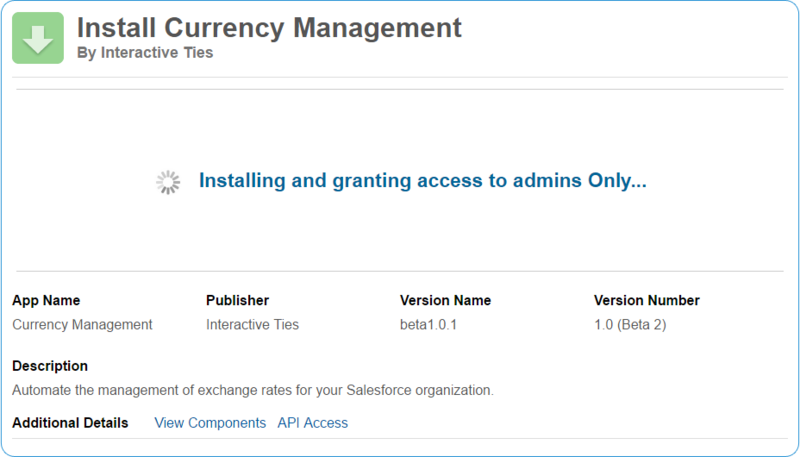 Click the button reading "Currency Management Application" to return to Salesforce.